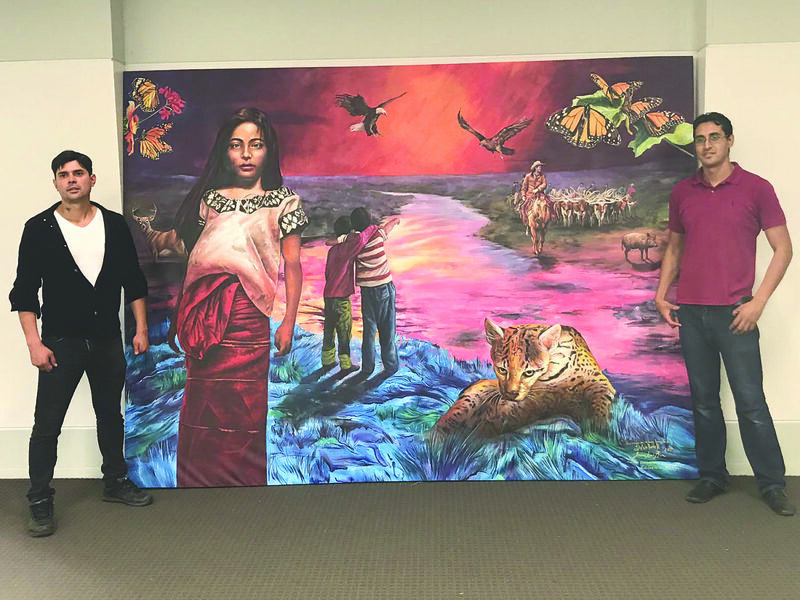 McALLEN — After a temporary art exhibition closes next week, the Mexican Consulate here will have a permanent memory of the show in the form of a mural, the latest piece of art a local attorney has donated to the community. The mural, titled “Los colores del Bravo,” was painted by brothers Imuris Aram and José Arturo Ramos Pinedo, muralists from Zacatecas, Mexico. It depicts the people of both sides of the Rio Grande against the backdrop of the flora and fauna that unite the region, such as the ocelot, javelina, crested caracara and monarch butterfly. Acting Consul General Socorro Jorge Cholula was drawn to the mural, which is installed in an event space on the building’s second floor, because of its powerful message. “The visual is poignant and it reflects the essence of our borderlands, which has a diversity that transcends mere biculturalism and succeeds in representing the distinct cultures within our community that converge, coexist and interact,” the Mexican consul said in a statement to The Monitor. McAllen attorney Gerardo Arriaga donated the artwork to the consulate as part of his effort to bring more public art to Hidalgo County to, as he puts it, “enrich the community.” He’s previously donated two murals to the city of Pharr, one of which hangs in the Pharr Memorial Library and the other inside the South Pharr Development & Research Center. “I said, ‘There’s nothing on your walls, your walls seem awfully white,’” said Arriaga, adding the consul general was incredibly receptive to receiving the artwork, simply requesting the mural depict the border. It will be displayed on the second floor of the building in a room used to host events and meetings. The Mexican Consulate is featuring a weeklong exhibit of the brothers’ work through Thursday, April 4, which is free to the public and open during the consulate’s regular business hours.